I always knew the hammer throw was a special sport, but HMMR Media science correspondent Zach Hazen just explained to me why. Hazen is one of the smartest guys I know. Not only is he an aerospace engineer and a self-coached thrower approaching 70-meters, but his team the Chicken Whisperers designed and flew the world record setting aircraft at this summer’s Red Bull Flugtag. Watch a video here. Recently he emailed me with an interesting analysis he did. Based on his calculations, more kinetic energy is imparted to the hammer than any other throwing implement he analyzed. For those like me that get lost when people start talking about physics, the kinetic energy of an object is the energy it possesses because of its motion. This may sound like a little convoluted claim to fame, but as Hazen puts it, energy is everything. This proves my theory that everyone thinks their event is the best. 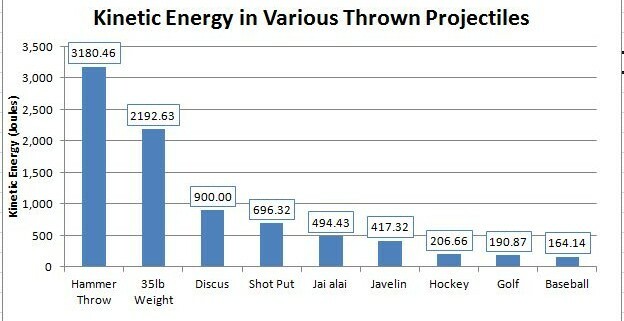 I’ve always said that the hammer demonstrates the most power of the throws – c’mon, a 16 lb ball going 80m?? Nothing comes close. But is the most power the coolest? As it happens, I like the idea of high speed being the measure of what’s coolest. Coincidentally, what do you suppose is the fastest thing in track and field?? Keep guessing..Yes, it’s the release of the javelin!!! That means it must be the coolest event… Wait, I once had a distance runner tell me what a bunch of lazy slobs the field athletes were, because we didn’t have to endure the awful pain that he and his fellow runners did. If you use pain as a measure, ok, you win. But I told him it was pretty painful to have to listen to him…good thing he was really drunk or it might have gotten serious for a brief moment..
What makes hammer cool (and also pole vault to a certain degree) is that the athlete is doing something with the implement for a decent amount of time. OK – javelin throwers do hold it for a while on their run up but even when they do get to the dizzy heights of running from the edge of track they only pull the javelin for a short time (hand back to release). 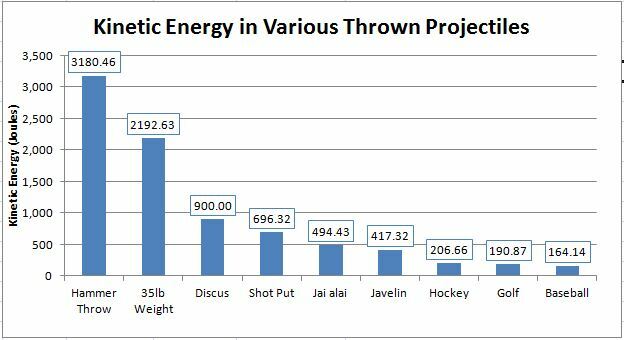 Shot & discus also have this “disadvantage” that the athlete is not in contact with the implement for the longer period of time that the hammer thrower enjoys. The hammer thrower is holding and pushing the implement for a considerable longer amount of time and the force imposed on the athlete gives them feedback. Just give a 7-8 year old a light rubber hammer to throw & they will ask to do it again, then you need to stop doing a dozen winds! It’s the contact time which gives feeling & feeling = fun. Another point to consider is that the hammer is a great equaliser in that the strongest/tallest/fastest athlete isn’t always the best. Kids will realise pretty early on that if the put some work into the hammer that they will release it further. Duncan – I’m just saying the hammer is cool, not that it’s the best. Every event has an advantage. But of course everyone loves their event the most … that’s why choose it. Gareth – Another unique point is that (like in the pole vault) the implement also acts upon us. In the other throws we apply force to the implement. In the hammer it applies force back on us.